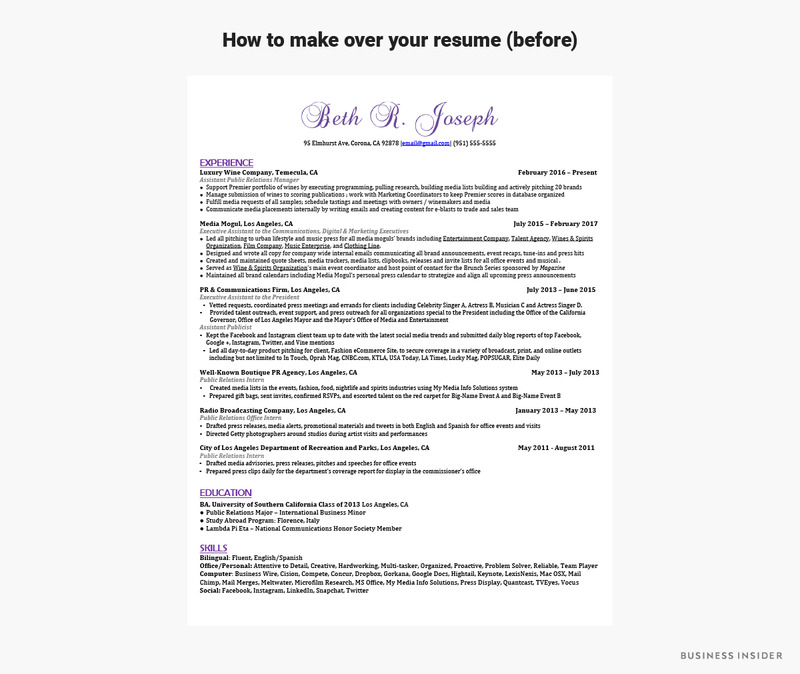 The best time to update your résumé is when you don’t need it right away. When you land a new job, it’s hard to imagine there’s any need to update your résumé once again. Perhaps you just updated it to land the role, and, at the very least, you don’t have plans to pursue a new gig after just landing this one. 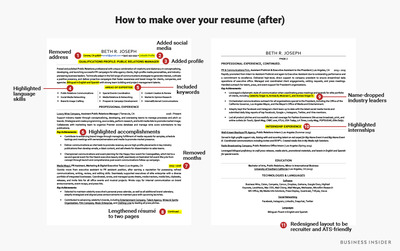 If you’re like most people, you’re probably going to wait until something happens that triggers your need to update your résumé. According to astudy by TopResume, 73% of employed professionals are open to exploring new job opportunities, even though they enjoy their current job. But if your résumé isn’t up to date, you may not be ready when that opportunity comes your way. 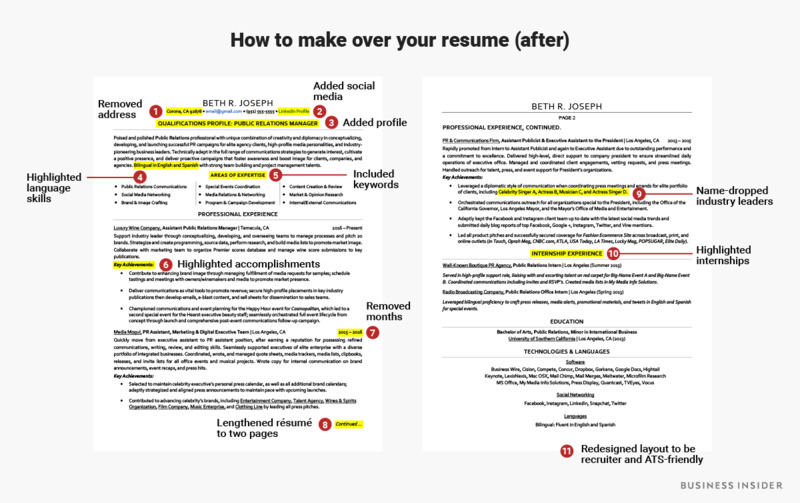 As part of Business Insider’s résumé makeover series with TopResume, we thought we could help. We asked TC Paulson, a résumé writer with TopResume, to rewrite Beth’s résumé now that she’s moved into her first management role to help reflect her progression. With an up-to-date résumé, she’ll be prepared should a networking contact or a recruiter reach out with an interesting opportunity, Augustine said. Overall, TC adjusted the format and presentation of Beth’s résumé to make it easier to read and scan through electronic applicant tracking systems. TC also beefed up Beth’s résumé to match the strength of her career’s trajectory and crafted statements to reflect her creativity, her communications expertise, and her talents in diplomacy. “This can often be an intangible, yet essential aspect of a résumé for someone in her field of PR,” TC told Business Insider. Augustine said she encourages candidates to include their city and state if they’re local candidates, but there’s no reason to provide additional details about where you live. “They take up precious space on your résumé and can be considered a security threat – think about all the places you post your résumé online,” she said. TC added a link to Beth’s LinkedIn page, while Beth made sure her other relevant social media accounts, such as her Twitter account, were linked to her LinkedIn profile. “While it’s important for most candidates to add LinkedIn to their résumé, it’s even more so for Beth, since she is in PR, and social media is a critical area of expertise for her career progression,” Augustine said. TC created a qualifications profile for Beth “that set the tone for the rest of the résumé,” Augustine said. Below that, TC included Beth’s professional summary, which Augustine said gives the reader a sense of Beth’s most marketable soft skills and hard skills and the extent of her experience. 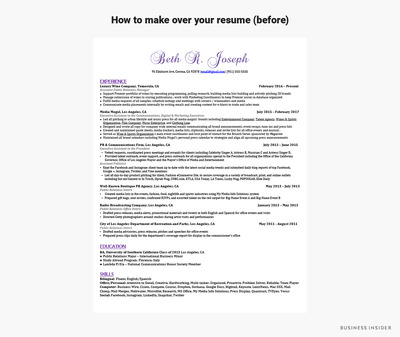 “While you might be able to get away with omitting a professional summary from your entry-level résumé, you must include something at the top of your mid-level résumé that summarises your goals and value proposition,” she said. “Think of it as the place where you incorporate your elevator pitch into your résumé,” Augustine said. “A proficiency in another language is a good selling point in virtually every role,” Augustine said. TC not only incorporated the word “bilingual” in Beth’s professional summary but also listed her language skills in a languages section at the end of her résumé. TC also included the term “fluent” in the languages section to include all the keywords a recruiter or ATS system may be trained to seek out. TC incorporated these keywords and phrases throughout every section of Beth’s résumé, from the “Areas of Expertise” table at the top to the “Technologies” section at the end. “This technique will also help Beth’s résumé pass the robotic screen and advance it to a live person for review,” Augustine said. In describing Beth’s experience, TC emphasised her accomplishments over the tasks she was responsible for. “When you’re describing your experience, dedicate a few lines to explain your responsibilities, and then use bullets to accentuate your most important and marketable contributions and achievements,” Augustine said. “Remember, bullet points are tools to attract the reader’s eye – use them sparingly,” she said. In Beth’s case, though, she said there weren’t any major gaps in employment, so TC chose to use only years to represent Beth’s tenure. “By doing so, this also eliminated extra words and gave the design of the résumé a cleaner, less cluttered look,” Augustine said. “Even if an ATS scan isn’t going to recognise a certain musician, or the significance of a well-known media mogul, we want the hiring manager to notice these names once the résumé reaches her hands,” Augustine said. This was one reason why some of Beth’s internship experience was included in her final résumé, she said. “In most cases, once a professional graduates, enters the ‘real world,’ and racks up a few years of marketable experience, it’s time to remove any references of their college career from their résumé, including school activities and internships,” Augustine said. But TC intentionally included some of Beth’s internship experience in her résumé. “It is also important for professionals like Beth to demonstrate that she can work with various organisations, from boutique agencies to large corporations to municipalities,” Augustine said. Augustine said that applicant tracking systems – the bots that scan your résumé and decide if you’re a good fit for the position – tend to have trouble reading and parsing résumé information when it doesn’t follow a traditional layout. To solve this, TC streamlined Beth’s résumé overall so that recruiters and hiring managers may review information quickly. “With clearer headings and more organised content, it will also play well with the ATS software,” Augustine said.